Lactate dehydrogenase is an ubiquitous enzyme that catalyzes the reversible oxidation of lactate to pyruvic acid. Lactate dehydrogenase is present in all cells of the human organism. Its concentration is especially high in cardiac and skeletal muscle, the liver, red blood cells and platelets. While these isozymes catalyze the same reaction, they differ in their physical (molecular weight, isoelectric point, temperature of denaturation), as well as catalytic properties (Michaelis constant (KM), optimal pH and turnover number). This reaction only takes place if the oxygen concentration of a cell is limited, for example in the contracting skeletal muscle. 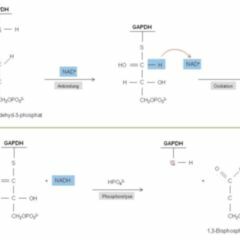 In those cases the cell cannot generate enough NAD+ from NADH through the respiratory chain in order to maintain the reactions of glycolysis. This is remedied by reducing pyruvic acid to lactate which enables the quick generation of NAD+ from NADH. 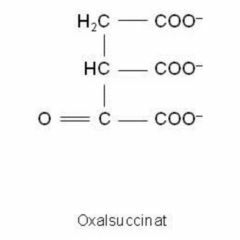 If enough oxygen is available (for example in cardiac muscle), pyruvic acid is converted to acetyl-CoA so it can be fed into the citric acid cycle. 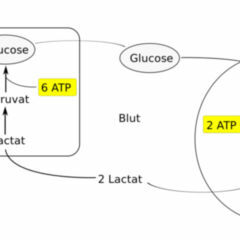 This way the cell gains much more ATP than by converting pyruvic acid into lactic acid. These circumstances explain why the isozyme LDH 1 can be found in high concentrations in the heart, whereas LDH 5 occurs especially in skeletal muscle: It makes sense to use an LDH isozyme with a high turnover number (M-type subunit) in skeletal muscle where the sustained contraction requires quick synthesis of NAD+. Cardiac cells mainly exhibit the isozymes LDH 1 and 2 because here pyruvic acid is preferentially fed into the citrate cycle which generates more energy. This is achieved by the low turnover number of those isozymes and the fact that their activity is inhibited by pyruvic acid under physiological conditions. LDH 1 and 2 are also called α-Hydroxybutyrat-Dehydrogenase and play a role in diagnosing heart attacks. 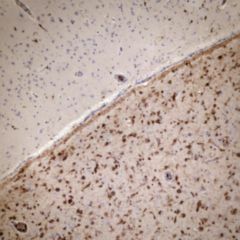 The serum concentration of lactate dehydrogenase is about 90-250 IU/L, although the level might be significantly increased under certain pathological conditions. This is often the case when large numbers of cells go into apoptosis, e.g. during hemolysis. LDH is used as a biomarker for hemolysis and as an non-specific tumor marker. In vitro hemolysis can also cause high levels of LDH.